The Legion of Mary is a worldwide association of Catholics who, with the sanction of the Church and under the powerful leadership of Mary, the Mother of God, have formed themselves into a Legion for service to the Church. At Sacred Heart Parish, the Our Lady of Perpetual Help Praesidium of the Legion of Mary meets every Tuesday at 9:00 AM in the Parish Office Conference Room . During our meetings, we pray the Rosary and other prayers, discuss the previous weeks work and plan future work. A conference of the Society of St. Vincent de Paul was meeting in Dublin, Ireland around 1917 when a number of ladies were asked to help the St. Vincent de Paul Brothers in serving free breakfasts to poor children on Sundays. After some time, the breakfasts were discontinued but the women continued meeting regularly on Sundays until 1921. On the evening of September 7, 1921, fifteen of the ladies met with Mr. Frank Duff and Father Tohler. Those seventeen people began to map out the Legion of Mary. They decided on weekly meetings and weekly active work. As work, they decided to undertake the systematic visitation of the Dublin Union Hospital, visiting in pairs. They decided that they would also undertake apostolic work each week, which had to be substantial. A President and a Secretary were appointed. So with the first Vespers of Our Lady’s birthday the Legion of Mary was ushered into the world. Mr. Frank Duff continued to be a guiding light for the Legion until his death in 1980. 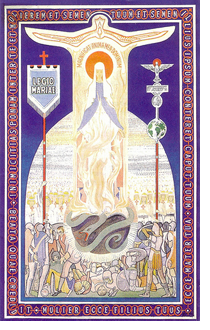 The objective of the Legion of Mary is to; (1) make its members better Catholics and to mobilize the Catholic laity, (2) raise the spiritual level of the entire community through direct contact with and interest in every member and potential member of the Mystical Body of Christ, and (3) accomplish this through Mary, Mother of Souls and Mediatrix of All Grace. The Legion of Mary Praesidium has two types of membership, Active, and Auxiliary. Active Members attend our meetings, perform work, and daily say several prayers (the Rosary and several others). Auxiliary Members daily pray the same prayers as Active Members, but do not perform works and need not attend the meetings. The work of the Legion falls under the general category of the visitation ministry. We currently visit shut-ins, local nursing homes and hospice facilities to be present to those who have no one, and to pray with those who are most in need. Our ministry also involves the Traveling Mother of Divine Mercy Prayer Group. As part of this prayer and visitation ministry, a family is invited to choose a certain statue of the Blessed Mother to be placed in the family’s home for a short time. Members of the Traveling Mother of Divine Mercy Prayer Group are invited into the same family’s home for prayer as everyone gathers around the statue of Our Blessed Mother praying to God through Mary our Mother. Prayer includes, the Divine Mercy Chaplet, the Rosary, some additional prayers and songs. Afterwards, everyone shares in a meal. Substantial benefits await those who join the Legion of Mary. The Legion will give you a chance to dedicate yourself to Mary’s service. By actually working for her, your love for her will be translated into action. You will grow in your Faith, and the gifts of grace you received in Baptism and Confirmation will be developed. You will enjoy the friendship of your fellow Legionaries and the friendship of those for whom you work. To receive these benefits, you need only a willingness to let our Lady use you as you are. She needs your hand and feet, your lips and heart, your time and effort, for Legionaries are simply Mary’s means of action in the world today. She will use what you give her to the best advantage, for although others may surpass our offering, they cannot replace it.